I recommend them if someone thinks they've lost something. I thought I had lost everything, and I was not hopeful at all, but they got everything back. I had gone to a couple of different places, and they really didn't know what the real problem was. DriveSavers gave me hope, and I was confident that they would get my data back. They actually extended above and beyond what I expected them to be able to do. I love that they are service oriented. Everybody involved was friendly and polite. They were friendly and responsive. They explained what needed to be done and how. They did the work well, and afterwards, they walked me through everything. I also like that they are open twenty-four hours a day. DriveSavers Data Recovery provides a wide range of data recovery services for clients throughout Northern California and the world. 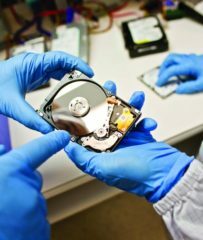 The company primarily focuses on recovering data from crashed and damaged computer hard drives, but it also has the capabilities to retrieve information from solid state devices (SSD), digital camera cards, tablets, smartphones, flash memory, and high-end storage devices such as RAID, SAN, and NAS. DriveSavers Data Recovery also provides eDiscovery and digital forensic services for legal professionals, law enforcement, and individuals who require data to be recovered and preserved for court cases and other legal matters. 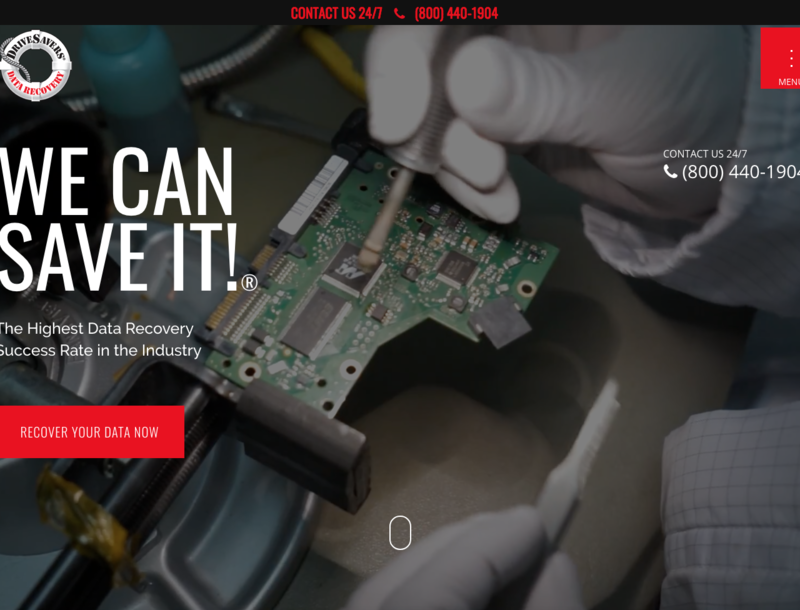 DriveSavers Data Recovery implements a customer-oriented business approach that includes providing clients with a data recovery advisor who manages their specific data loss issues. “Offering the ultimate customer experience is just as important to us as successfully recovering data,” says Mr. Moyer. DriveSavers certified engineers have extensive knowledge about all types of computer storage. DriveSavers Data Recovery has been providing data recovery services for clients throughout Northern California and beyond since 1985. The company’s main focus is recovering data from crashed and broken computer hard drives, but it also has the capabilities to retrieve information from smartphones, tablets, digital camera cards and various removable media devices. Choose the right data recovery company to maximize your chances of getting back your important data. Backup your data on a regular basis, and always run a backup before upgrading your computer system. Keep a copy of your backup files in the cloud or offsite. Immediately shut down your computer if you hear any unusual sounds such as grinding, repetitive clicking or whirring sounds. Call a professional data recovery firm right away. Be sure to install and use updated virus protection software. New computer viruses appear frequently so always maintain the antivirus updates to protect your data. Install a high-quality surge protector or an uninterruptible power supply (UPS) to protect your computer equipment from power spikes and interruptions. Avoid using home remedies found on the Internet to recover your vital information. 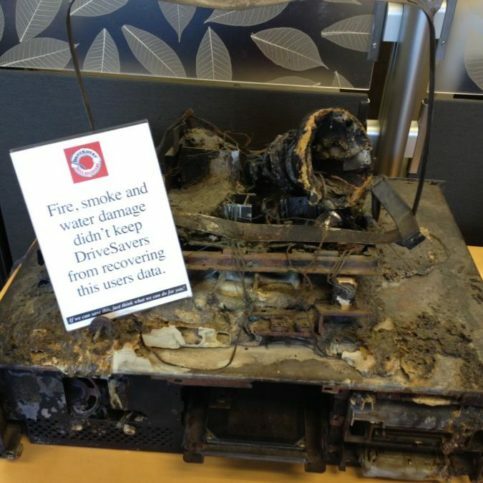 If your data is important, call a professional data recovery provider. Q: How soon can I get my data back? A: We offer around-the-clock priority service, so we can restore your data right away if it’s an emergency. For less urgent situations, we offer one- to two-day service. We also offer five- to seven-day service if your need isn’t urgent. Q: Do you offer an evaluation service? A: Yes. 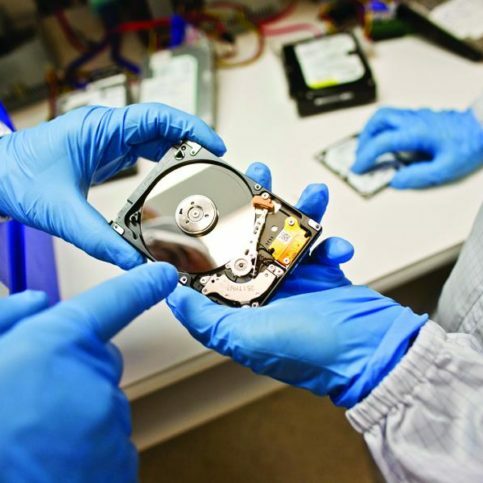 You can send or bring in your hard drive or computer and we’ll evaluate its recoverability. There is no charge for the evaluation, and afterward, we’ll call and tell you what we’ve determined. Q: What types of operating systems and equipment can you restore? A: We work on all types of operating systems and storage devices, including laptops and desktops; iPhones and iPads; tablets and smartphones; SSD devices; RAID, NAS and SAN devices; and digital camera media. Q: How do I know if my data is worth restoring? A: It really comes down to the value of the data. If the lost data is important to you or critical to your business, restoration is definitely worth it. However, if it’s insignificant or can easily be recreated, you may not require data recovery. Q: Do you provide bilingual services? A: We serve customers worldwide, so we offer services in many languages. We have a list of toll-free phone numbers on our website that customers can call to get service in their native language, including Spanish, French, German and Gaelic. Data lives in a lot of places, from desktop and laptop hard drives to external drives to the cloud. Regardless of where your data lives, the important thing is that it lives in multiple locations—preferably at least three. Why? Devices can fail unexpectedly, and once your data is lost, it’s often gone forever. By copying your data to a variety of locations, if one of your devices fails, you’ll still have it saved elsewhere. Diamond Certified Expert Contributor, Mike Cobb: We all know we need to floss our teeth every day. But we don’t always do it. We need to also back up our data every day, but we don’t always think about it. So, what’s important? What is data? Data is what lives on your computer that you can’t live without or you don’t want to miss if it goes away. So, we need to back that up. Where is your data? It’s on your computer. It’s on a flash drive. It’s on a RAID system if you’re in a business environment. It’s on the cloud. So, why is it important to back up? It’s important because if you lose it on whatever that device is, it’s gone forever. So, all devices fail. Your hard drive, your SSD, and your flash. SO, that’s why you want to have multiple copies onto different devices. So, if you have your data, your important data on a hard drive, back it up to a flash drive. Back it up to an external hard drive. And then if you can, back it up to the cloud. If you have trouble making a backup or figuring out your plan to back up, call an IT professional. They’ll be more than happy to help you out. And if you promise to do that today, I’ll go home and floss my teeth. DriveSavers Data Recovery : Average 9.4 out of 10 based on 230 unique customer surveys of customer satisfaction. Any time we have anything that they do, we go straight to them. Their prices are reasonable, and they always meet or beat others' prices. They were quick and courteous. It always is a pleasant experience. They are a good company that can get you your files back from a computer that is no longer working. They are great. I have no idea, everything I guess. I liked their customer service. They were very nice on the phone. They actual did a great job. I hear horror stories about these computer places, but they did an awesome job. They were able to handle my issue. I liked working with the team there. They are awesome and easy to deal with. They made a complicated process really simple. I think they are very professional and quick. They got all my files back in a timely manner. They are good. They are centrally located. They do a good job. They accommodated my timing and schedule. They did what I needed done right then. They do a good job and you should trust them. I thought their service was fine. It was a very routine visit, quick and easy. They called me and told me exactly what they needed to do, and they got it done quickly. They were professional. I would highly recommend them. They did a really good job. I ordered the work and I didn't have to wait for them long. I liked their professionalism, I am a stickler about doing things right, and they did just that. I'm happy with their services. I think they have a really good business. It helped me a lot and I suggest people use it for any computer repairs not just to recover lost data. They were able to not only recover the full Windows OS I had running, but they were able to get my computer running faster, and bring back all my files. The work was great and personal attention to detail. They were able to help me out, no issues or problems. I would say, look around at other places. They aren't clear about how long it will actually take to get the work done. It's in a convenient location, that's about it. I love the way that they do business. The process is so easy and kind of fun to use in a way. I always see new stuff when I go in, like the inner workings of computers and stuff, it's fun. I liked their process the best.